A shield representing the national ideology Pancasila ("The Five Principles"). Blazon: Quarterly Gules and Argent (national colours), parted per fess by a thick line Sable (symbolising the Equator); in the 1st quarter a banteng (Javanese wild bull) cabossed proper (for the 4th Principle), in the 2nd quarter a banyan tree proper (for the 3rd Principle), in the 3rd quarter a sprig each of paddy and cotton both proper (for the 5th Principle), in the 4th quarter a ring of chains Or (for the 2nd Principle); on an inescutcheon, Sable a mullet Or (for the 1st Principle). The feathers of the Garuda are arranged to represent the date 17 August 1945, the day on which Indonesia's independence was proclaimed. The national emblem of Indonesia is called Garuda Pancasila. The main part of Indonesian national emblem is the Garuda with a heraldic shield on its chest and a scroll gripped by its legs. The shield's five emblems represent Pancasila, the five principles of Indonesia's national ideology. 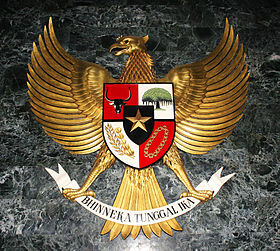 The Garuda claws gripping a white ribbon scroll inscribed with the national motto Bhinneka Tunggal Ika written in black text, which can be loosely translated as "Unity in Diversity". Garuda Pancasila was designed by Sultan Hamid II from Pontianak, supervised by Sukarno, and was adopted as the national emblem on 11 February 1950. Statue of King Airlangga depicted as Vishnu mounting Garuda. Garuda, the discipled carrier or vehicle (vahana) of Lord Vishnu, appears in many ancient Hindu-Buddhist temples of ancient Indonesia. Temples such as Mendut, Borobudur, Sajiwan, Prambanan, Kidal, Penataran, Belahan, and Sukuh depict the images (bas-relief or statue) of Garuda. In Prambanan temple complex there is a single temple located in front of Vishnu temple, dedicated to Garuda. However, there is no statue of Garuda inside the chamber today. In the Shiva temple, also in Prambanan complex, there is a relief telling an episode of Ramayana about Garuda's nephew who also belongs to the bird-god race, Jatayu, tried to rescue Sita from Ravana's hand. The deified statue of King Airlangga depicted as Vishnu mounting Garuda from Belahan, probably the most famous statue of Garuda from ancient Java. Now the statue is one of the important collection of Trowulan Museum. Garuda appear in many traditions and stories, especially in Java and Bali. In many stories Garuda symbolises the virtue of knowledge, power, bravery, loyalty, and discipline. As the vehicle of Vishnu, Garuda also bears the attributes of Vishnu, which symbolise preservation of cosmic order. Balinese tradition venerated Garuda as "the lord of all flying creatures", and "the majestic king of birds". In Bali, Garuda traditionally portrayed as a divine creature with head, beak, wings, and claw of an eagle, while has the body of a human. Usually portrayed in intricate carving with golden and vivid colours, as the vehicle of Vishnu or in battle scene against Nāga (dragon) serpents. The important and noble position of Garuda in Indonesian tradition since ancient times has venerated Garuda as the national symbol of Indonesia, the embodiment of Indonesian ideology, Pancasila. Garuda also chosen as the name of Indonesian national airlines, Garuda Indonesia. Next to Indonesia, Thailand also uses the Garuda as its national symbol. After the Indonesian National Revolution ended and followed by the Dutch acknowledgement of the Indonesian independence in 1949, there is a need to create a national emblem of United States of Indonesia. On 10 January 1950 the Committee of State Seal was formed, under co-ordination of Sultan Hamid II of Pontianak as the State Minister of No Portfolio, with Muhammad Yamin as the chairman, and Ki Hajar Dewantara, M. A. Pellaupessy, Mohammad Natsir, and Raden Mas Ngabehi Poerbatjaraka as committee members. The committee task is to select the proposals of United States of Indonesia national emblem to be presented to the government. The initial design of Garuda Pancasila design by Sultan Hamid II, still featuring an anthropomorphic Garuda. According to Mohammad Hatta, in his memoire "Bung Hatta Menjawab", to fulfill the mandate of the Cabinet, Minister Priyono had launched the design competition. After the competition was held, there were two proposed designs selected as the finalist; one was the work of Sultan Hamid II and the other one was the work of Muhammad Yamin. In further process the design proposed by Sultan Hamid II was accepted by both People's Consultative Assembly (DPR) and the Government, while Yamin's design was rejected because featuring shining sun emblem that deemed clearly demonstrate the influence of Japanese Empire flag. Sukarno as The President of United States of Indonesia together with Mohammad Hatta as the Prime Minister, asked Sultan Hamid II to change the red and white ribbon being held by Garuda talons to white scroll bearing the national motto "Bhinneka Tunggal Ika". On 8 February 1950, the design created by Sultan Hamid II was presented to President Sukarno. The design featuring Garuda in its anthropomorphic form, similar to traditional depiction of Garuda in ancient Javanese, Balinese, and Siamese art. However, the Islamic party Masyumi expressed their objection and stated that the bird with human neck and shoulders with both hands holding the Pancasila shield was too mythical. The Garuda Pancasila adopted on 11 February 1950, still without crest and with different position of talons. Sultan Hamid II edited his design and proposed the new version, this time discarding the anthropomorphic form, the eagle-like Garuda was done in stylised naturalistic style and named Rajawali (eagle) Garuda Pancasila. President Sukarno presented this design to the cabinet and Prime Minister Hatta. According to AG Pringgodigdo in his book "Sekitar Pancasila" published by the Minister of Defense and Security, the improved design of Garuda Pancasila by Sultan Hamid II was officially adopted in United States of Indonesia Cabinet Assembly on 11 February 1950. At that time, the Rajawali Garuda Pancasila was still "bald" without crest crowning its head like current version. President Sukarno introduced the national emblem of Indonesia to the public at Hotel Des Indes, Jakarta, on 15 February 1950. Sukarno continued to improve the design of Garuda Pancasila. On 20 March 1950, Sukarno ordered the palace artist Dullah to make several improvements according to his suggestions, such as the addition of a crest and the change of talons position to the scroll. It was believed that Sukarno suggested the crest addition because the "bald" Garuda was considered too similar to the bald eagle in the United States Great Seal. Finally, Sultan Hamid II gave the final touch and create the official national emblem rules on scale and color guide. The design of this last version was still remain the same ever since, and officially recognized and used as the national emblem of the Republic of Indonesia. The Garuda clutches in its talons a scroll bearing the National Motto of Indonesia, "Bhinneka Tunggal Ika" which is an Old Javanese stanza of the epic poem "Sutasoma" attributed to the 14th-century poet sage of the Javanese Majapahit Empire, Empu Tantular. The text was redesicovered by the Dutch scholar Brandes from among the many lontar manuscripts among the Dutch booty called the Lombok treasure — looted from the destroyed Lombok palace in 1894. who is said to have committed the phrase to writing for the first time. The poem expounded a doctrine of reconciliation between the Hindu and Buddhist faiths: meaning literally "Although diverse, both truthful to Dharma — thus there exists no duality in Truth". This spirit of religious tolerance was an essential element in the foundation and security of the newly emerging State of Majapahit and the thusly fledgling Republic of Indonesia. It is roughly rendered, Diverse, yet united or perhaps more poetically in English: Unity in Diversity. The official Indonesian language translation is: Berbeda-beda namun tetap satu jua. A depiction of the Garuda Pancasila on a c. 1987 poster; each tenet of the Pancasila is written besides its symbol. The National Emblem is used to symbolise Indonesian government and as official emblem of Indonesian ministries, departments and institutions. It is commonly displayed in Indonesian state palaces, monuments, government offices, buildings and also Indonesian embassies abroad. It is also used in private offices and buildings, also in the classes of public schools, placed on the wall slightly upper than the President's and Vice-President's photographs that flanked the emblem. Also, it is used on the front of every Naval vessel, denoting governmental status of the vessel. Moreover, every governor and head of cities or regencies wears the National Emblem on their headgear's badge. The President uses it on every plane he/she travelled with. Every Ministry, Provincial, Military and Police flag also uses it on one side. The Indonesian National Emblem is used as part of governmental institutions' and organisations' emblems. Such as being included within the emblems of Corruption Eradication Commission (KPK), General Elections Commission (KPU), People's Representative Council (DPR), and Regional Representative Council (DPD). In sports, many sport branches uses the National Emblem as their uniform insignia, such as football, creating the nickname for the Indonesia national football team as the "Garuda Team". However, some elements of Garuda Pancasila is used in some on non-national and non-governmental organisation. For example, the Great Indonesia Movement Party (Gerindra) used the head of Garuda Pancasila as the main part of their symbol. The rallying symbol of Prabowo Subianto's 2014 presidential campaign also used the Garuda Merah (red Garuda), a red silhouette of Garuda Pancasila, which raised the controversy and protest whether a partisan non-governmental organisations should be allowed on using the national emblem as rallying symbol. The controversy also raised from pro-Prabowo musician Ahmad Dhani who campaigned through a music video that displays golden Garuda Pancasila — which looks like the German imperial eagle, in aesthetic imagery reminiscent of Nazi's style fascism. The red Garuda is again used as part of Prabowo's campaign for presidency in the 2019 election. The statue of Garuda Pancasila displayed in the Ruang Kemerdekaan (Independence Room) at the National Monument (Monas), Jakarta. The Garuda is the mythical golden eagle, common to both Hindu and Buddhist mythology. The Garuda was a chimera, having the wings, beak, and feet of the golden eagle, but a man's arms and trunk. The Garuda is commonly used as an emblem in South and Southeast Asian nations. The use of the Garuda in Indonesia's coat-of-arms invokes the pre-colonial Hindu kingdoms that spanned across the archipelago, from which the present-day Republic of Indonesia is understood to be descended. However, unlike the traditional anthropomorphic form of Garuda as featured in ancient temples in Java, the Balinese Garuda, or the national emblem of Thailand, the design of Indonesia's Garuda Pancasila is rendered in modern naturalist style. The design of Garuda Pancasila was inspired by the elang Jawa or Javan hawk-eagle (Nisaetus bartelsi), an endangered raptor endemic to the mountainous forest regions of Java. The Javan hawk-eagle's resemblance to the Garuda Pancasila is most obvious with the prominent crest crowning its head and the plumage coloured dark-brownish to chestnut-gold. By presidential decree, the Javan hawk-eagle was legally registered as the national bird of Indonesia, and thus attributing the endangered species very high protection. As for the national emblem, the Garuda symbolises strength and power, while the gold colour symbolises greatness and glory. These numbers of feathers correspond to "17/8/1945" international date format for Indonesian Independence Day. Each section of the shield has a symbol corresponding to the Pancasila principles laid down by its founder, President Sukarno. The numbers of some elements in these symbols might evokes certain numbers, such as 17 which represents the 17 August and the number 5 which represent Pancasila itself. The escutcheon is a martial symbol, representing the defence of the country. It is divided into five sections: a background divided into quarters, coloured red and white (the colours of the national flag) in a checkerboard pattern; and a smaller, concentric shield, black in background. A thick, black line lies horizontally across the shield, symbolising the equator which passes through the Indonesian archipelago. The black shield bearing the golden star at center corresponds to the first Pancasila principle: "Belief in One Supreme God" (Ketuhanan yang Maha Esa). The colour black represents the colour of nature. Upon this shield at centre is a golden, five-pointed star. This is a symbol common not only among Indonesia's sanctioned faiths of Islam, Christianity, Hinduism, Confucianism and Buddhism, but of the secular ideology of socialism as well. This tenet of Pancasila has always been controversial, for it suggests compulsory religious belief as well as compulsory monotheism. Supporters of Sukarno's legacy, however, believe that this tenet was meant to unify Indonesia's population, who have diverse faiths and beliefs. In the bottom right quarter, on a red background, is a chain made up of square and round links. This chain represents successive human generations, with the round links representing women and the square links representing men. There are 9 round links and 8 square links, together they sum the number 17. The chain corresponds to the second principle of the Pancasila, the principle of "Just and Civilized Humanity". At the upper right quarter, on a white background, is the banyan tree (Indonesian, beringin). This symbol corresponds to the third Pancasila principle, the principle of "The Unity of Indonesia". The banyan is known for having expansive above-ground roots and branches. The Republic of Indonesia, as an ideal conceived by Sukarno and the Nationalists, is one country out of many far-flung cultural roots. In the upper left quarter, on a red background, is the head of the Javanese wild bull, the banteng. This represents the fourth principle of Pancasila, the principle of "Democracy that is Guided by the Inner Wisdom in the Unanimity Arising Out of Deliberations Amongst Representatives". The banteng was chosen to symbolise democracy as Indonesians saw it as a social animal. The banteng was also adopted as a symbol of Sukarno's Nationalists, and later by his daughter Megawati Sukarnoputri's Indonesia Democratic Party of Struggle. In the lower left quarter, on a white background, are a gold-and-white paddy and cotton. There are 17 seeds of rice and 5 cotton buds. These represent the fifth Pancasila principle, the principle of "Social Justice for the Entire People of Indonesia". The rice and cotton represent sustenance and livelihood. The Garuda Pancasila song was composed by Sudharnoto as a patriotic song to commemorate the Indonesian struggle. Wikimedia Commons has media related to National coats of arms of Indonesia. Wikimedia Commons has media related to Garuda in Indonesia. ^ a b c d e f g h i j "State Emblem". Indonesia.go.id. Retrieved 23 March 2012. ^ Purwadi, Kisah cinta Ken Arok-Ken Dedes. Media Abadi: 2004. ISBN 979-3525-08-8. 200 pages. pp. 155-157. Rwâneka dhâtu winuwus Buddha Wiswa, Bhinnêki rakwa ring apan kena parwanosen, Mangka ng Jinatwa kalawan Siwatatwa tunggal, Bhinnêka tunggal ika tan hana dharma mangrwa. ^ Santoso, Soewito Sutasoma. 1975. A Study in Old Javanese Wajrayana. New Delhi: International Academy of Culture. 1975. Page 578. ^ Heri Akhmadi, 2009. Breaking the Chains of Oppression of the Indonesian People. ISBN 978-602-8397-41-4. Equinox 2009. 276 pages. xcviii, footnote 65. ^ Rendy Sadikin (8 July 2014). "'Garuda Luka' Serang Prabowo-Hatta Lewat Dunia Maya". Tribunnews.com (in Indonesian). Retrieved 14 October 2014. ^ Ina Parlina; Margareth S. Aritonang (26 June 2014). "Nazi-inspired rocker hurts Prabowo's bid". The Jakarta Post. Retrieved 14 October 2014. ^ Marlinda Oktavia Erwanti (10 October 2018). "Seperti 2014, Prabowo Kembali Pakai Garuda Merah di Pilpres 2019". Detik.com (in Indonesian). ^ Keputusan Presiden No. 4/1993, issued on 10 January 1993, the status of Elang Jawa (Javan hawk-eagle) as the national bird of Indonesia (Widyastuti 1993, Sözer et al. 1998). Department of Information, Republic of Indonesia (1999) Indonesia 1999: An Official Handbook (No ISBN). This page was last edited on 9 April 2019, at 06:40 (UTC).